Easy Friday 010: Arrested Development’s People Everyday | THE GOOD . . . THE BAD . . . AND ME. Having an eclectic taste in music and other stuff, I haven’t closed myself out of appreciating the diverse music styles and forms of the 90’s. From Pearl Jam to the Beastie Boys, the 90’s became a learning experience that shaped my musical brain and made me even love Afrocentric, gangsta rap artists like Arrested Development. 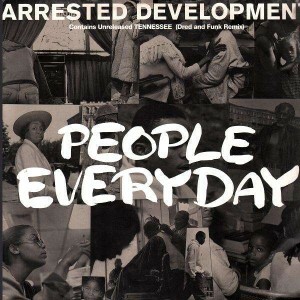 So, without further ado, here’s one of my all-time favorites, People Everyday by Arrested Development. Living in a highly religious city in the country (Lipa City), it’s the norm to be silent. It’s well and good for me. Finally, I’ll have the peace and quiet I thought will only happen in my dreams. But that doesn’t mean I’ll just lay back and deprive myself of music. It’s the life in my veins. Music supplies me with inspiration to beat off the humdrum of an otherwise boring existence. Thank heavens for headsets! I can still rock with high volume without bothering my neighbors, because I’m considerate unlike others.